NO DRIVING TO THE RANGE. I live out in the country, I have a big backyard. Addicted to Golf. Sign me up! Pretty simple, a real Dixon golf ball attached to a nylon/bungee rope. You need at least 20 yds of practice area where there’s no one around. Anchor the rope to a weight or other heavy object. Face the bolt that attaches ball to the rope towards the weight. Keep rope curved and out of swing path and commence your shots with your mid-irons. For use on grass only. 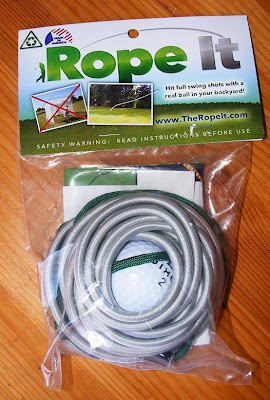 When I don’t have a lot of time before a round I can setup the Rope It in a couple of minutes in my backyard and get a quick warm up. I love to practice golf in my backyard. I do lots of chipping and short pitches which is great. So being able to use the Rope It with my mid irons adds a new element to my backyard practice. You can only use the Rope It with your mid-irons (6 through 9) so not being able to use a driver, fairway wood or hybrid seems limiting. The ball is attached to a rope by a bolt so at times feedback on your mid-irons feels some what off or muted but hey your hitting a real golf ball right. For those of us that are busy and addicted to golf. The Rope It is $20 well spent. It’s easy to set up and use in your backyard or your nearest park. Great practice for your mid-irons that will only help you in the long run when you hit the course. Holy doodle. My first thought was it'd fly back and DESTROY MY TEETH or something, but wow, that works pretty well. Nice. and 20$ is EXTREMELY reasonable for something like that. I'd buy one. It sounds good in theory but the I-hook in the ball must mean that the ball has to be place perfect each time unless you want to ruin your clubs. The videos show ball flight and not all the time it will take to set it up in between shots. The ball flight isn't long enough to give you feedback on what your doing wrong.